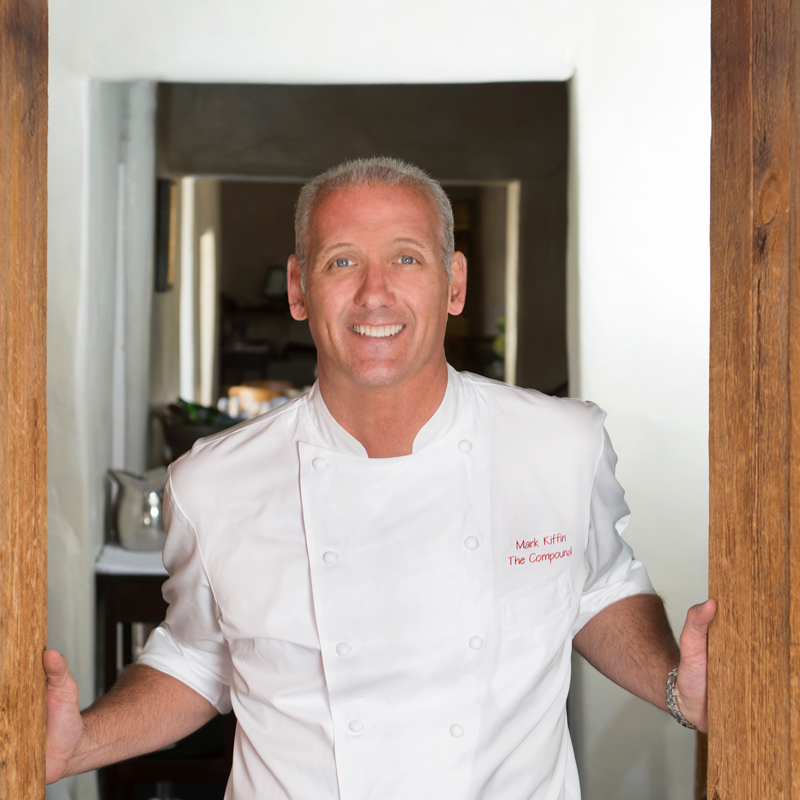 Mark Kiffin, celebrated Chef, Owner and author of the Compound Restaurant won the prestigious James Beard Foundation award as Best Chef of the Southwest 2005. The Compound is Santa Fe's premiere restaurant with Chef Kiffin's acclaimed seasonal contemporary American cuisine derived from Santa Fe's rich heritage of regional and Mediterranean influences. The New York Times, Gourmet Magazine, Wall St. Journal and Wine Spectator have all selected the Compound as Santa Fe's favorite. Selected as one of the nation's finest restaurants and highly regarded for its award-winning seasonal American cuisine, beautiful historic setting, gracious service, extensive wine cellar and incomparable weddings, The Compound is dedicated to providing its guests an elegant, inviting and altogether unforgettable dining experience. Chef Kiffin reopened The Compound, a long-time beloved culinary presence located in the heart of Santa Fe's cultural Mecca, Canyon Road, renowned for its distinctive style and elegance since the 1960's, on May 30th, 2000. Through Chef Kiffin's diligence and dedication, the restaurant has been re-invigorated, has reclaimed its original stature as a leading destination, and is currently one of the very finest restaurants in the region. A recognized leader in Southwestern cuisine, Kiffin has developed a unique and exciting signature Contemporary American menu, focusing his seasonally evolving menu on true regional ingredients and New World influences, deftly combined with the culinary style and flavors of the Mediterranean. Since taking the helm at the Compound, Chef Kiffin was first personally honored and invited to participate in the Master Guest Chefs series at The James Beard House in New York City in January 2001. Since this dinner Chef Kiffin has participated in several Beard events including hosting a prestigious out-of-house James Beard Foundation Dinner in March 2002 and was one of only 25 chefs invited from around the world to cook at the James Beard Foundation Awards reception, the culinary equivalent of the Oscars. In December 2004, Chef Kiffin, along with chef friends, Jose Andres of Jaleo in Washington DC, and Guillermo Pernot of Passion in Philadelphia, returned to the House, for a Christmas "Tres Amigos Celebration Dinner". Selected by Restaurant Hospitality Magazine as a "Rising Star Chef," Chef Kiffin started working in the kitchen at age 15. A native of Colorado, he graduated from the Culinary Institute of America in 1982. Most recently, Kiffin served as Corporate Executive Chef for Star Concepts, parent of Dallas' famed Star Canyon and AquaKnox restaurants, working directly with Chef/Owner Stephan Pyles and was in charge of all culinary operations, the "New Tastes from Texas" PBS cooking show, while overseeing all design, building, and opening of new restaurants; including Star Canyon and Cañonita in the Venetian Hotel in Las Vegas, Nevada. Beginning in 1990, Chef Kiffin partnered with owner Mark Miller at the famed Santa Fe-based flagship Coyote Café and later Coyote Café MGM Grand in Las Vegas, where he acted as Corporate Executive Chef. During his 8-year tenure at Coyote Café, Kiffin co-authored three books with Miller: Coyote's Pantry (Ten Speed Press, 1993), The Great Salsa Book (Ten Speed Press, 1994), and The Indian Market Cookbook (Ten Speed Press, 1995). Chef Kiffin also created, designed and tested many of Coyote Café's popular line of Southwestern food products under the Coyote Cocinas brand. In addition, he worked as a consulting Chef for the opening of Miller's Red Sage restaurant in Washington, D.C., and was periodically a guest chef there. Chef Kiffin co-wrote his fourth cookbook, The Steak Lover's Companion (Harper-Collins, 1996), with Fred Simon, president and CEO of Omaha Steak International. Based on his work at The Highlands Inn in Carmel California, Mark has been a featured chef in the prestigious Art Culinaire Magazine and in the book Cooking With the Masters of Food and Wine (Bon Vivant, 1997).Under the attentive, energetic leadership of Chef/Owner Kiffin, The Compound was named "Restaurant of the Year, 2000-2001", in the Santa Fe Reporter's Annual Dining Guide and "Best New Restaurant" in New Mexico's Culinary Magazine, La Cocinita. In October 2002, Gourmet Magazine listed The Compound in its "Guide to America's Best Restaurants." Bon Appétit lauded The Compound in the current April 2004 issue, in the Top Tables section: "The Restaurant Reporter; Around the Country and Around the World Where to Go Now", and Chef Kiffin was recently featured as a Guest Chef for the 17th Annual Masters of Food and Wine, hosted by Food and Wine Magazine, and presented by Wine Spectator. Chef Kiffin enjoys teaching and has appeared as a guest chef at numerous national and international food events including, but not limited to, Wolfgang Puck's Meals on Wheels in Los Angeles, California; Epcot International Food and Wine Festival in Orlando, Florida; The Aspen Food and Wine Festival in Aspen, Colorado; The James Beard House in New York City; Masters of Food and Wine in Carmel, California; the Naples Winter Wine Festival in Naples, Florida; The Four Seasons and Regent Hotels in Singapore; the International Olive Council seminar in Morocco, North Africa – not to mention guesting at numerous prestigious wineries throughout the United States.